Skipper Steve McNulty is aiming for promotion to the Championship before he calls time on his Hatters career. The 31-year-old, who signed for Luton in January 2013, is now five games away from his 100th appearance for the club. McNulty is desperate for Town to reach League One at the first attempt, and believes they have the potential to go even further too. He said: “I’ve loved every minute of it here. I came in at tough times when the club were struggling a little bit, but I’m enjoying my football. “I love being down here, love everything about the club, players, staff, people behind the scenes, long may it continue. I’ve got another year left and I just want this club to outgrow me. McNulty helped Hatters to another clean sheet during the 0-0 draw with Shrewsbury on Thursday, their 12th this term. 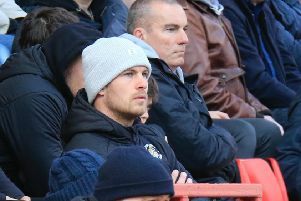 Luton’s defensive record didn’t come as a surprise to the captain, who also believes his side will turn around their struggles in front of goal too.